We had a week of eating too much, baking with Grandpa, shopping with Grandma, and playing with cousins. The Fort of Awesomeness has been equipped with a heater and is now a year-round facility. Planning Christmas morning away from home is challenging. We ordered many items online and had them shipped directly to Grandma & Grandpa’s, we packed some items that we’d shopped for in person, and then we left some items to purchase once we arrived in town–like, the toe of the stocking is always a piece of produce, so that had to wait until the last minute. So I was a bit discombobulated. I like to drag everything out a week ahead of time and just ponder what exactly is going where: usually it’s a big and hard-to-wrap item for the girls to share from Santa, a few wrapped presents from Mom and Dad, and then stuff in the stockings and a few more things that don’t fit in the stockings. With Cute W and I doing things on our own and squirrelling items away, sometimes we end up uneven or duplicating each other, and I like to know that ahead of time. So that was a bit tough. We ended up shifting the big-and-bulky Santa gift to something from us and my parents that we could present at home, I obsessed over charts enough that M & J were pretty equal when we unpacked all the boxes in KC, and the little glitches (Cute W and I had purchased similar books, and I couldn’t find a pair of earrings that I’d packed away for J) were resolved. So, we made it. I went to go quiz J, but she was already asleep. Also in Kansas City, we saw The Hobbit. I was only asleep for about half an hour of it. 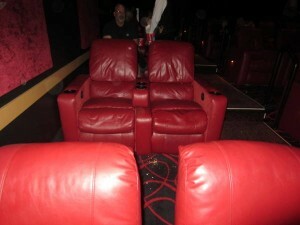 Which is pretty impressive, considering the theater seats, which were freakin’ barcaloungers. I am not even kidding. The entire theater was filled with these, and the space between each row was, like, eight feet. How’s that for ridiculous American decadence? On our trip to the movies, I also saw perhaps the best mall Santa I’d ever encountered: beautiful costume including an embroidered vest and authentic boots, great face, glasses, and beard, and a mild and gentle demeanor. He would hold these slightly frightened children on his lap and speak to them so quietly and earnestly that it appeared that he’d been waiting just for each of them in turn. He was doing it before the movie, and three hours later, there he was. I wanted to take a photo of him, but of course that would have required a credit card. Here’s a final Christmas photo because I can’t believe that I’ve never shared the beautiful, beautiful stockings that my mother makes. That’s mine on the left, then M’s, then J’s, then Cute W’s. Our names are at the top. I think that she made mine first back when I was about six, then she’s gradually made one for all six of her kids, followed by every grandchild as they arrived, and each son-in-law, too, although those are “upon request” in case the incoming in-law wants to stick with their own stocking. She’s actually all caught up at the moment, which means that someone needs to get married or pregnant (not it!). *”The Mule” is a car-like farm-ish vehicle that M is permitted to drive even though it scares the living crap out of me every time.